I have partnered with Kansas Farm Bureau to bring you a recap of The Farm Food Tour and this easy, spicy, keto-friendly dish of Sausage And Beans that would also make a delicious holiday side dish! I like big cities and I cannot lie. The bigger the city, the better. 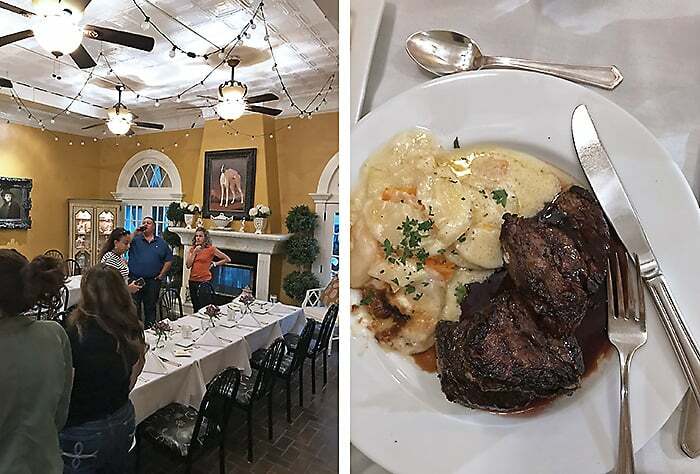 So, I wasn’t sure what to expect when I found out I would be joining 7 other bloggers, a 2-person media crew, a dietician, a farmer and folks from the Kansas Farm Bureau and Kansas Soybean Commission on the Farm Food Tour that took place in mid September. The Farm Food Tour of 2018 took place over 3 days, 6 meals and 7 very diverse farms. I went on this tour without many expectations, but, I cannot lie, I had my assumptions. I assumed that I would be visiting a bunch of farms, watching farmers in action and listening to Meagan (from the Kansas Farm Bureau) and Jancy (from the Kansas Soybean Commission) give us a narration of the goings on. I wasn’t expecting to engage in conversations with farmers who love this land and the God who gave it to them. Farmers who are more in tune with the needs and wants of their livestock than I am with those of my dogs. Farmers who are more passionate in pursuing knowledge than I am in checking my blog stats. 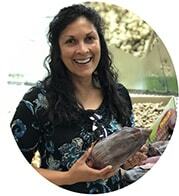 This tour was an experience that has grown me up in my knowledge of food and farmers. I cannot recall a time when I was so moved by what I learned and experienced in 3 days… and that’s not my old age talking. And, over the course of 3 blog posts over this month, I hope to share moments from each of those 3 days. Today is a recap of some of the highlights from Day 1 of the fifth #FarmFoodTour and a recipe that was inspired from our lunch. Day 1 had us trekking to Craig and Amy Good’s Farm, called “Good Farms” near Olsburg, Kansas. Craig and Amy have been raising heritage pigs such as Gloucestershire Old Spots and Durocs, Angus cattle, soybeans and corn since 1981. They believe that if they take care of their animals, their animals will take care of them. These quotes by Craig and Amy Good, “our interests not against the animals interests” and “we want to show people that we’re not out here trying to abuse the land and abuse our animals just to make a living” are my memorable quotes from day 1! Craig and Amy Good have been working with Heritage Foods whose mission is to save some of the smaller family farms and some of the more rare breeds of livestock such as Gloucestershire Old Spots that are antibiotic free. By the way, you can order cuts of Good Farms pork and beef at Heritage Foods USA. If you specifically want their meat you can request it, otherwise the order will be filled with whatever breeds Heritage chooses. 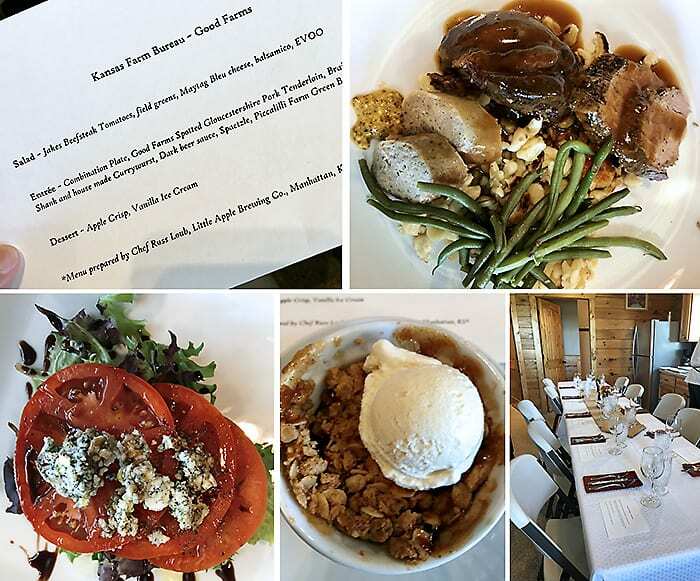 After a morning trudging around Good Farms, we got to enjoy a delicious meal put together by Chef Russ Loub of Little Apple Brewing Company at Good Farms. His entree was a combination plate which consisted of pork sausage and green beans in addition to a tender pork tenderloin. 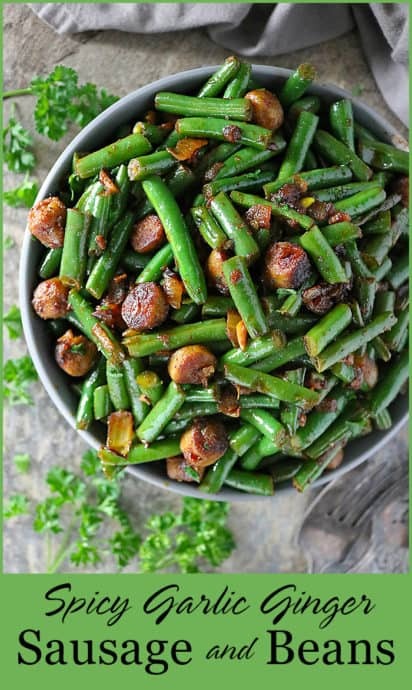 I so enjoyed the combination of those green beans and pork sausage and knew that I would have to recreate something similar as soon as I got home. Well, after lunch we were off to visit Derek (a fourth generation farmer) and Katie (a city gal prior to marriage) Sawyer at Sawyer Land & Cattle where cattle, soybeans, corn, sorghum and wheat are raised. 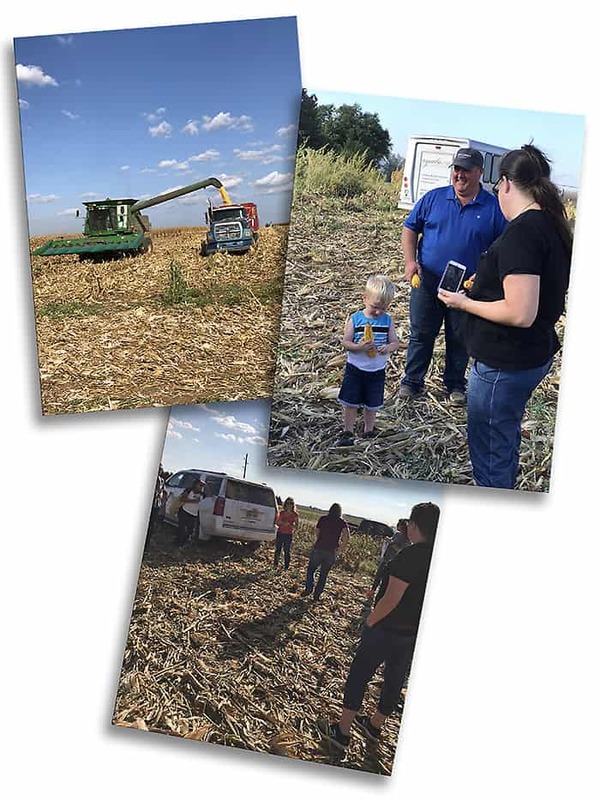 We got to see a combine harvesting corn (for feed) in action – some brave bloggers even hopped on the combine and rode it around. Katie had baked delicious chocolate chip cookies for us and we munched on those as we listened to her and Derek talk so passionately about their family, their livestock, their crops and everything in between. We ended our day with dinner at the swanky Courtyard on Main with the Sawyers. Soon after I got home, I happened to come across a box of Heritage Farms Pork Sausage at a grocery store in Atlanta and figured I had to try and make a Sausage and Beans dish in memory of that wonderful lunch. Now, this isn’t a replication of what I enjoyed that day. It is just a combination of two of my favorites on my plate from that lunch. 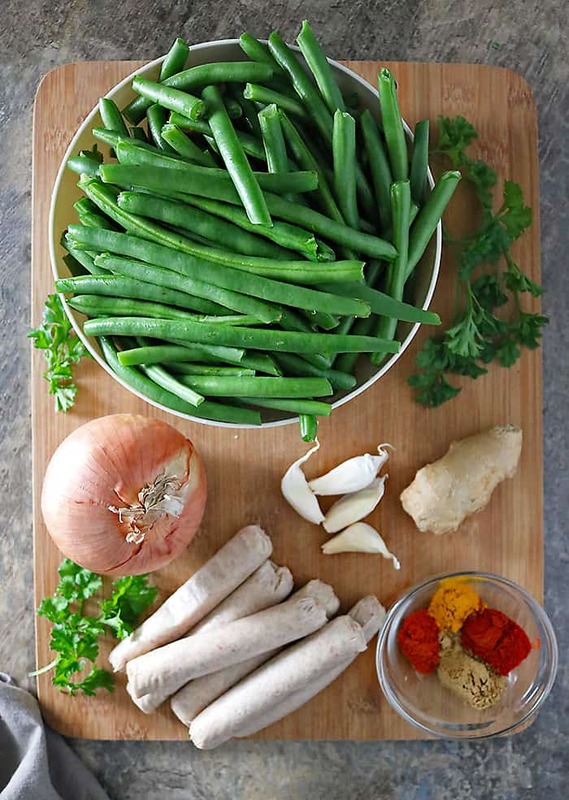 I added some onions, garlic, ginger, smoked paprika, chili powder, coriander and turmeric to the green beans and sausage to make this dish you see here. 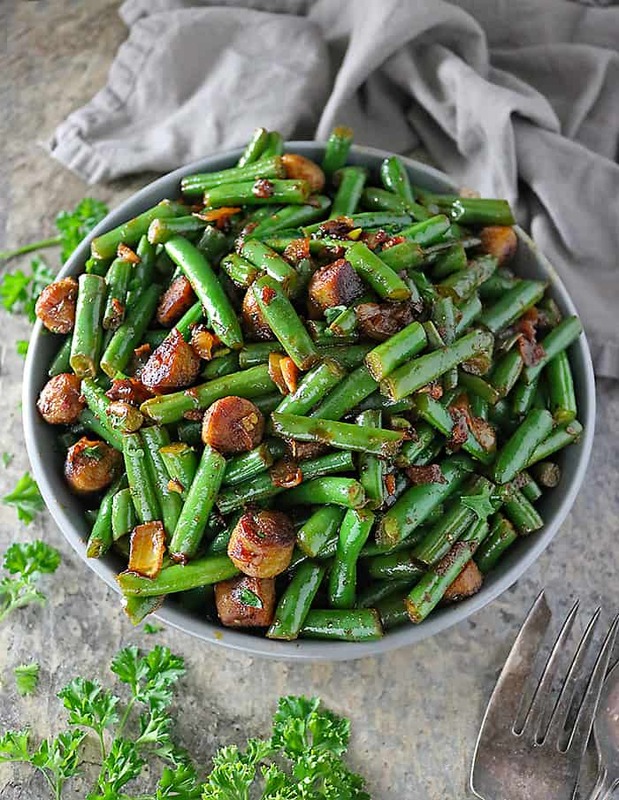 If you are looking for a light meal or a holiday side, I hope you try whipping up this easy spicy garlic ginger spiced, Sausage And Beans ~ it would be a delicious addition along with these Ginger Carrots and Asparagus! 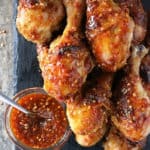 I would love to know if you’ve make this recipe or any other recipe from this blog so please do rate the recipe and let me know your thoughts on it in the comments below. You can also FOLLOW ME on FACEBOOK, TWITTER, INSTAGRAM and PINTEREST to get recipe ideas and inspo! 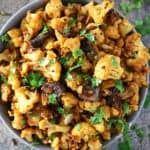 This easy, spicy, keto-friendly dish of Sausage And Beans flavored with coriander, smoked paprika, turmeric and garlic and ginger is sure to be a family favorite! Peel and dice onion and garlic and then add diced onion to a large pan along with the oil. Place pan over medium heat and let onion saute about 10 minutes stirring occasionally. While onion is sauteing, slice up the sausage links and wash and chop up the green beans. Add garlic, ginger and sliced sausage links to pan and let cook, stirring often, for another 10 minutes. Add in the green beans as well as the coriander, smoked paprika, chili powder, and turmeric and saute about 5 minutes, stirring often. 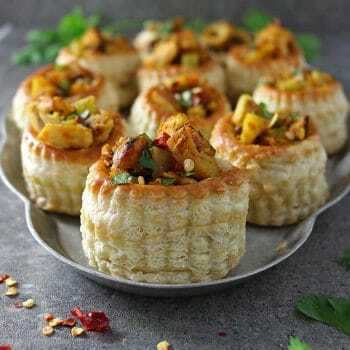 Season with salt and pepper, garnish with parsely and enjoy warm. *Nutrition info per Very Well Fit, please make sure to use your own calculations for accuracy. This looks great! I think it would make a great Thanksgiving side! This looks like a nice change from the usual side dishes. My husband would love it. This is so much more than just sausage and beans – love all of the flavors in this dish! 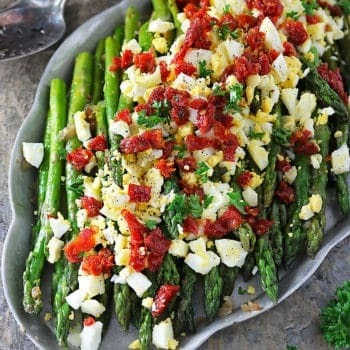 This looks so delicous! And I can make it on a weeknight. Woot woot! Looks like that you had lots of fun :-)) I have never been to a farm…would really love to visit one or two some day. Bean and meat (my favourite is pair with bacon) are always great together. Yours with sausage looks fabulous. Looks wonderful. Love the pictures, an hour or so drive down the road from us. I hope you saw some sunflower fields :). 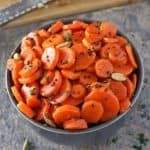 What a wonderful recipe!! 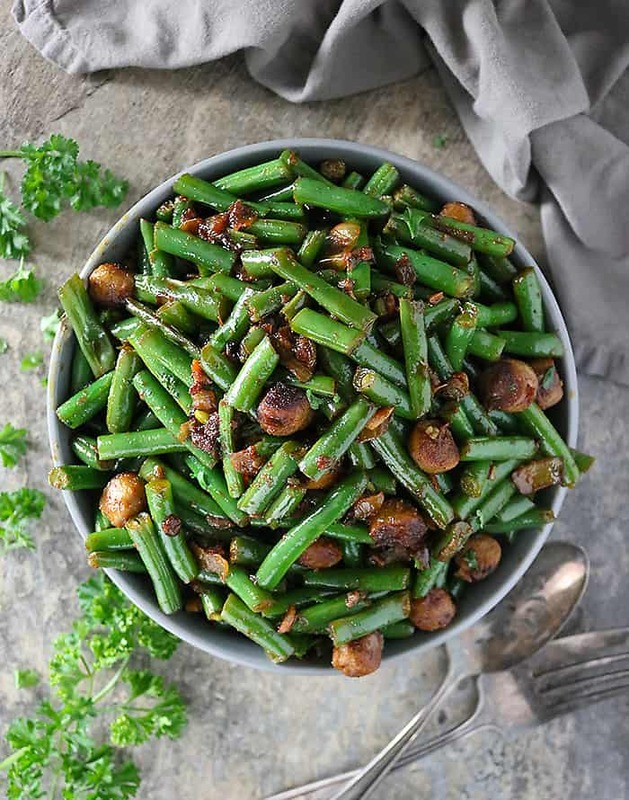 My family are big fan of sausage and green beans.. and the combinations sounds lipsmacking delicious..can’t wait to try it for my family! What a great post, Shashi! 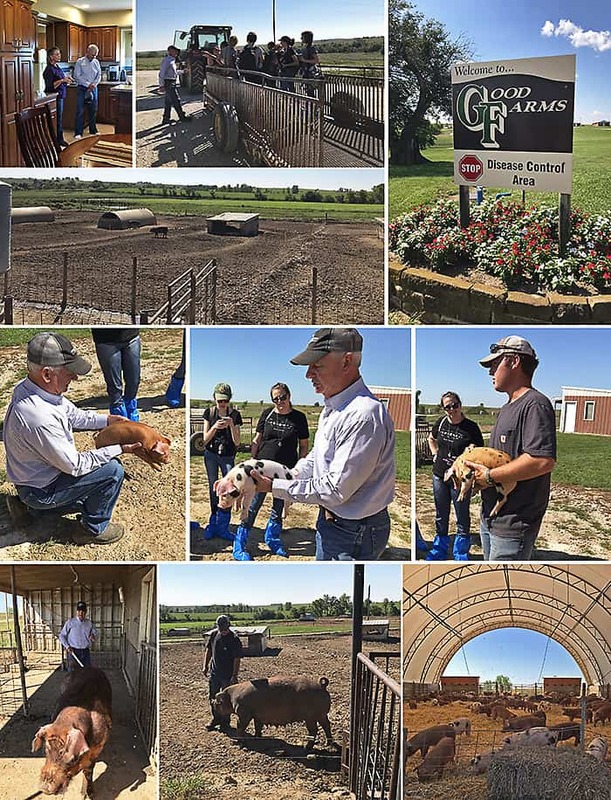 I’ve had the opportunity to visit some cattle farms in Kansas as well, and those farmers echoed the same sentiments that you shared from your visit. Hard-working, good people. There’s definitely something reassuring about that, and I love just listening to farmers share their experiences! And it looks like you guys and gals had some good eats out there, too. Speaking of good eats, this recipe sounds super easy but packed with flavor. I’d be on board with this one any night of the week…but I agree with Caitlyn that this would make a great Thanksgiving side dish! Thanks for sharing this experience, my friend! 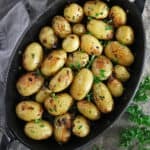 Having raised my kids on a small farm, I really enjoyed reading your post. Farming is hard work and something, I believe, takes a special person to do. 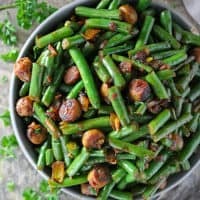 As for the green beans and sausage, I was thinking yea we had that dish as kids. But then I read your recipe and your twist in using smoked paprika, coriander, chili powder and such. 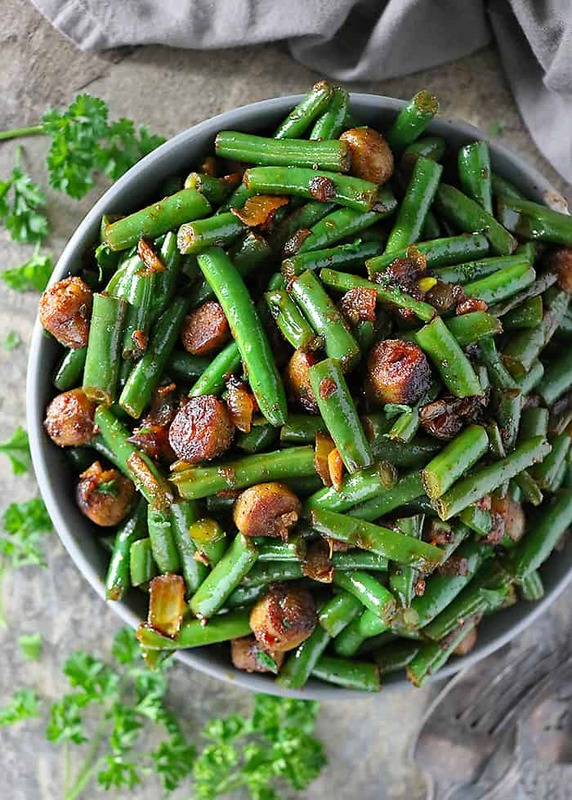 Wow, that’s a whole new green bean and sausage dish. Sounds great and we’ll trying this one out soon.